Simple Grilled Eggplant – Jay Luker – Really? ... Wow. Béa asks for favorite eggplant recipes. I only have one way I like to cook it these days. It’s a recipe shared verbally by an Israeli co-worker. I’ve got no measurements for you, but it’s simple enough. The ratio of lemon juice to tahini is the only part that took some experimentation. 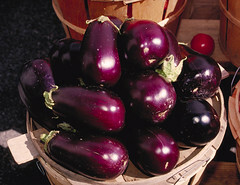 And it’s really best to use the fat/round varieties, like Dusky or “Italian”, rather than the long/skinny kinds–unless you’re really into eggplant skin, which I am not. Slice the eggplant crosswise into discs about 1/2 inch thick. Sprinkle both sides of each slice with a pinch of salt and toss them into a collander to sit for half an hour or so. Go fire up the grill while you’re waiting. You can also prepare the dressing/drizzle: whisk together in a bowl 2 parts lemon juice to one part tahini. For 2 good-sized eggplants this means about 2 T Tahini + 1/4 cup lemon juice. By the time your fire’s ready, the eggplant should have weeped out some of its slightly-bitter moisture. Wipe both sides of each slice with a paper towel to dry them and also remove some of the salt. Brush them with olive oil and spread them out in a single layer on the grill. Grill on both sides until they’ve developed some good grill marks and have lost their firmness. Pile the slices on a plate and drizzle with the lemon + Tahini mixture.